What a beautiful color! Cedar is such a spectacular wood. 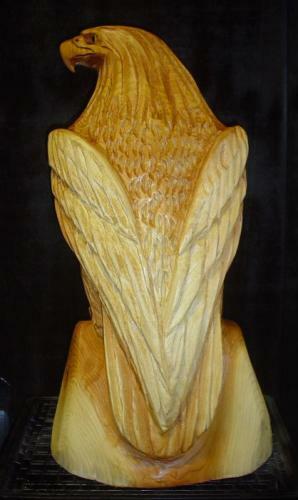 This particular eagle chainsaw sculpture shows the remarkable grain that is so prevalent in Eric's carvings. 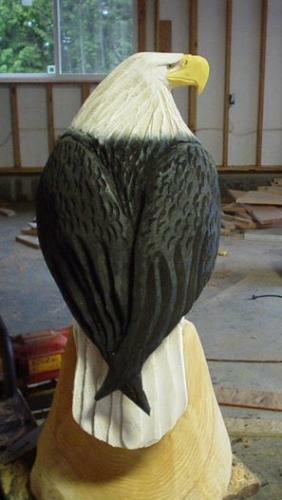 The eagle is approximately three feet tall with a short base which will allow the wood art to be displayed on the client's conference table. 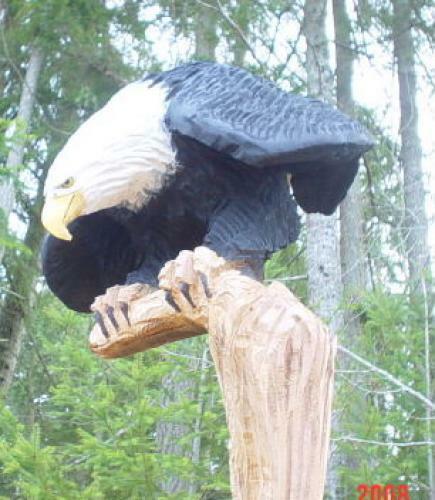 The abstract eagle is definitely a unique piece of chainsaw art work. It is carved out of western red cedar and resembles an eagle soaring above flames that threaten its home. Notice how the natural reds, yellows, and whites of the cedar flow together to combine with Eric's artistic vision. This is truly a beautifully sculpted piece of chainsaw carved artwork. 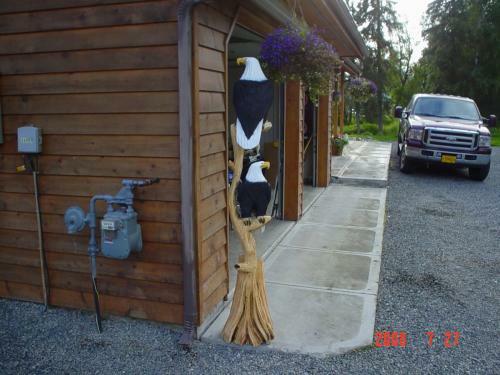 One of Eric's most popular art pieces is his double eagle tree sculpture. This one graces a client's front driveway. It stands ten feet tall. Looking to the right, this perched version of the majestic national bird, the American bald eagle, is a must have for any eagle lover. It stands approximately 3-4 feet and the white and black painting truly make this bird stand out. Over the years, happy clients have commented on how life-like Eric's sculptures are. 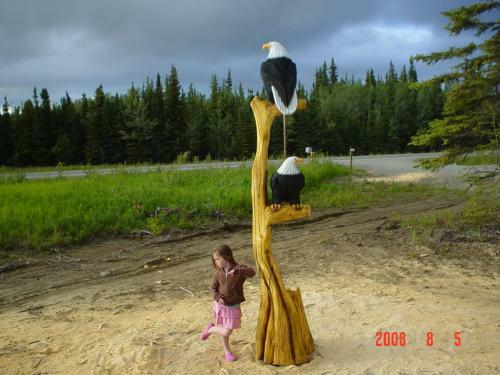 This past summer, 2009, an Alaskan eagle caretaker stopped in to visit Eric at The Dreamer's Woods and said she was blown away by the truly life-like quality and detail that Eric achieves in his sculptures. Coming from someone who studies and cares for eagles every day, Eric felt truly honored by the compliment. 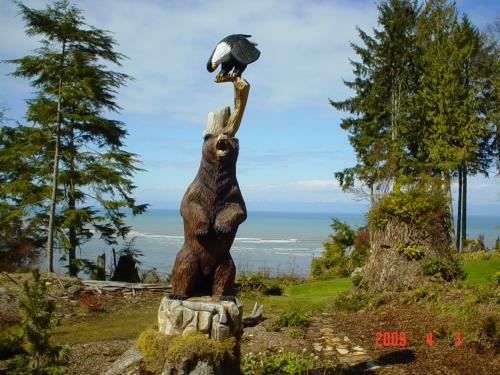 Now sitting on the bluff overlooking the Straits of Juan de Fuca, this magnificent work of art makes a statement. The sculpture depicts the struggle between the eagle and the bear for summer sustenance...the salmon. Who will win the prize this time? The eagle or the bear? This ten-foot chainsaw-carved art sculpture is truly one-of-a-kind. Shown here is Eric's award winning Sly Fish'n. 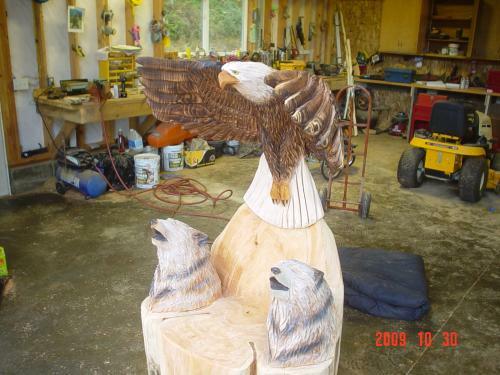 It was carved at the SawFest 2009 competition in Sterling, AK. This unique chainsaw carving depicts the cunning of two masterful hunters...the eagle and the fox. Notice the detail of the eagle as it appears to be about to launch from its perch to teach the invading foxes a lesson in stealing from the master of the Alaskan skies. 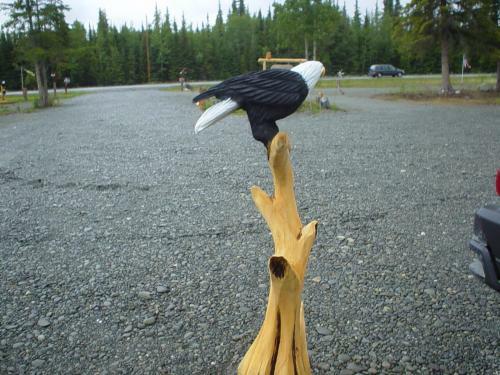 The artwork stands approximately 7 1/2 feet and is created out of Alaskan spruce. 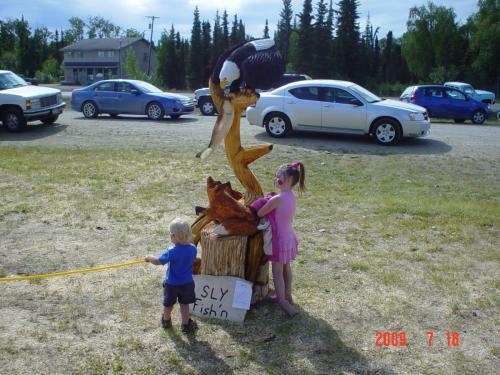 Another view of the award winning Sly Fish'n chainsaw carving. 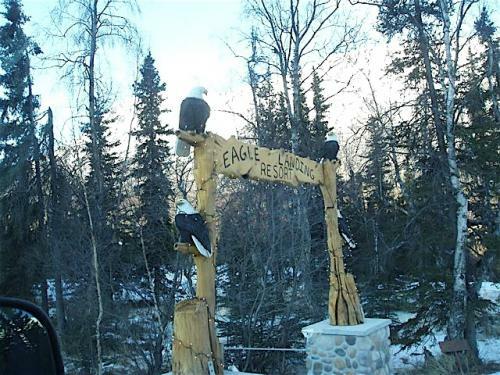 In 2008, after viewing Eric's SawFest 2008 competition sculpture of a ten foot double eagle tree, two clients who own a lodge right on the Kenai River in Cooper Landing, AK, approached him to create a landmark sign for their business. The couple loved his competition piece, but wanted something bigger. So, they asked him if he would create TWO double eagle trees with a carved sign in the middle. The result was this magnificent sign which sits right on the super busy Sterling Hwy. As the happy clients hoped, it has become a landmark. They told Eric this past summer that daily there are people stopping along the road and in the driveway just to take pictures with the sign. What a great investment! Eric absolutely appreciates the faith that Cooper Landing Resort placed in him for their advertising. 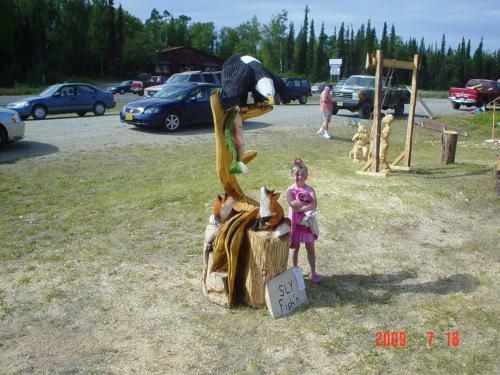 The sign stands approximately 14 feet tall and is carved out of Alaskan spruce. Made from western red cedar, this nearly seven foot throne is truly a piece of art! The intricate soaring eagle is incredibly stunning. And who wouldn't want a gorgeous wolf as a guardian? The Wilderness Throne is an awe-inspiring piece of chainsaw art work. Eric definitely outdid himself with this newest addition to the collection. 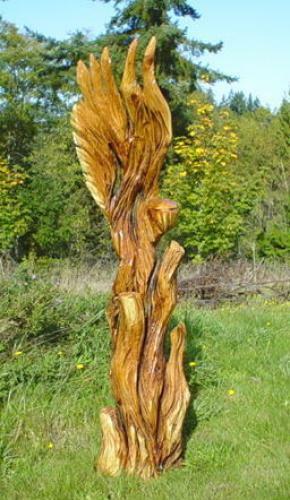 Side view of chainsaw carved Wilderness Throne wooden art sculpture. 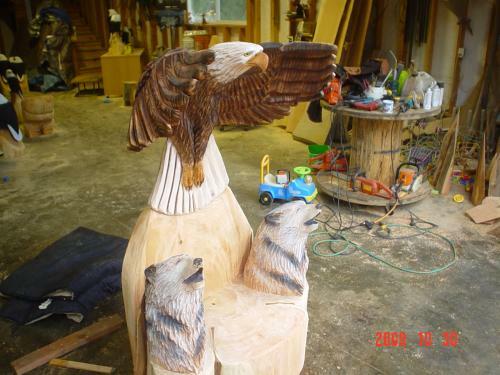 After seeing the ten foot version of Eric's double eagle tree chainsaw carving, the client asked if he could create a somewhat smaller version. Eric said no problem, and the wildly popular six foot version of the double eagle tree sculpture was born. This piece sits outside of the client's garage and just looks great. Here is the ten foot double eagle tree version. It is made from Alaskan spruce. Here is the another view of the ten foot double eagle tree. Standing approximately five feet, this single eagle tree is a definite eye catcher. 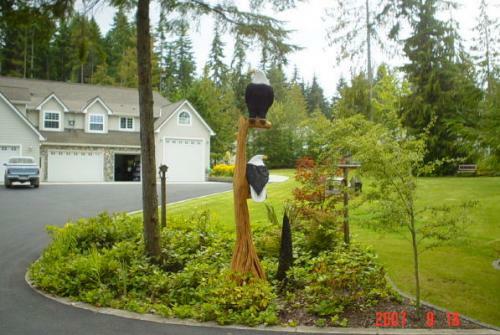 For those folks who don't have a lot of room, this is a perfect way to get the eagle tree look. This art piece is carved out of western red cedar. Pleased with their first Eric Berson piece of chainsaw carved artwork, happy clients returned to commission an even bigger piece. Having lost many trees in a micro burst of storms along the Straits of Juan de Fuca, the homeowners cut the remaining stumps at a variety of heights. 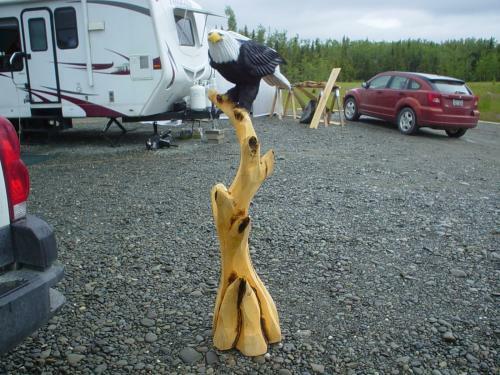 This sculpture came from a 14 foot stump from which they asked Eric to create an eagle tree. The stump seemed to speak three eagles, and so eventually that is what was carved. 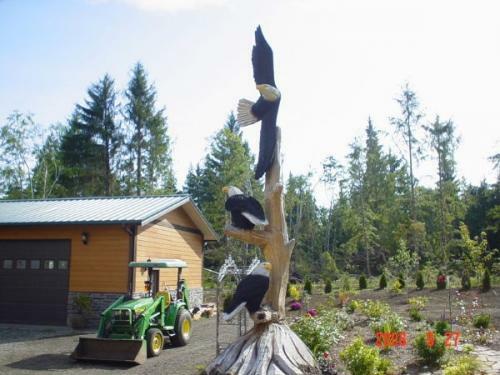 The soaring eagle sculpture with the perched eagles is absolutely majestic to behold. Side view of the 14 foot triple eagle tree art sculpture. 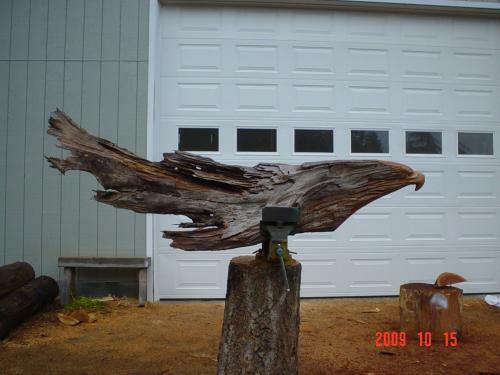 Here is a fantastic chainsaw carved depiction of the majestic eagle as it is about to launch off of a branch. Ever noticed those burned out looking logs just hanging out in the woods? Most people would write those logs off as unuseable and probably just cut them up for firewood. Not Eric. When a client offered him several logs from his property, Eric happily went to get the wood. While there, he noticed this neat looking old growth cedar snag and asked if he could have it. The client agreed and Eric brought it home. 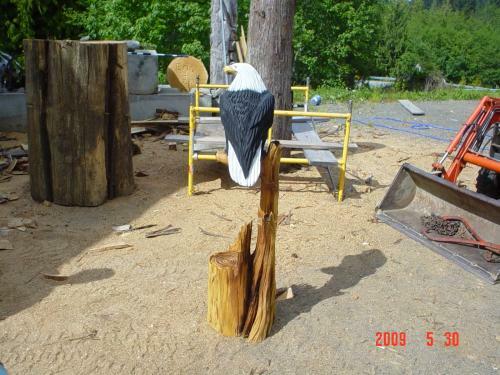 He said he just felt like the eagle head just needed to come out and now look at that snag! What a way to preserve the leftovers that nature gives us. This fabulous piece of chainsaw carved artwork is five feet long and will beautifully grace any mantle or wall. 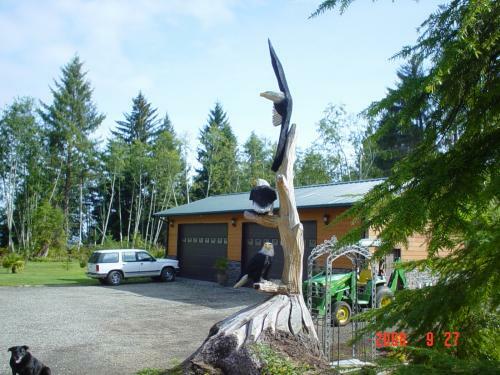 Back side of old growth cedar snag eagle head chainsaw carved art sculpture. 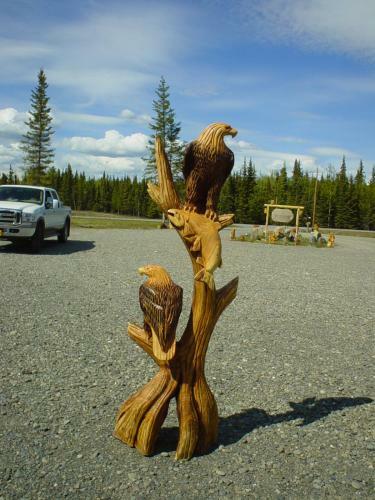 The newest eagles added to our 2010 chainsaw carving collection are these breathtaking double eagles with a mahogany stain on the tree. 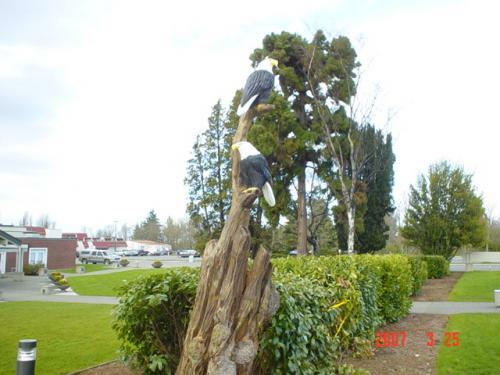 Eric used a huge cedar tree and ripped it in half; he then created two eagle sculptures. This one has a fish in its claws. We lightly burned the eagles' wings and then put a mahogany stain on the tree. It turned out absolutely gorgeous. 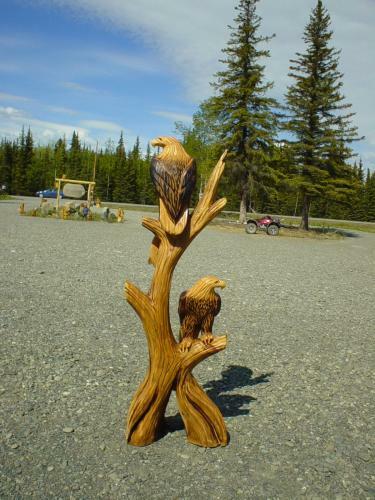 The clients had originally commissioned our standard double eagle trees, but when they saw this piece, they just had to have it. So, we made quite a show of taking pictures and then loading the sculpture into their truck. It was a gorgeous day which complemented a gorgeous piece of art. 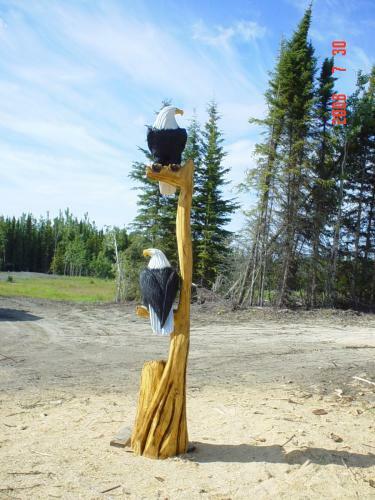 Here is the back view of the above gallery eagle tree. Just beautiful! This phenomenal gallery piece is the brother to the above mahogany-stained sculpture. This is a little over 6 feet (for perspective, Eric is 6'8") and shows the exceptional reds and yellows of the western red cedar's grain. Since we started with such a large tree, Eric was able to sculpt some dynamic movement within the artwork. He turned the top eagle almost 180 degrees from his standard style and was able to lift the tail a little more than usual. Also, since we had more wood with which to work, he was able to do more with the tree itself, thus giving him the opportunity to truly create a remarkable piece of chainsaw art. The clients were incredibly pleased with the sculpture. Carved from Alaskan spruce, this lovely edition to the 2010 carving collection only lasted a day before it was snapped up by a very happy customer. Standing nearly 6 feet, this dynamic perch portrays an eagle as it is just about to launch off his perch. 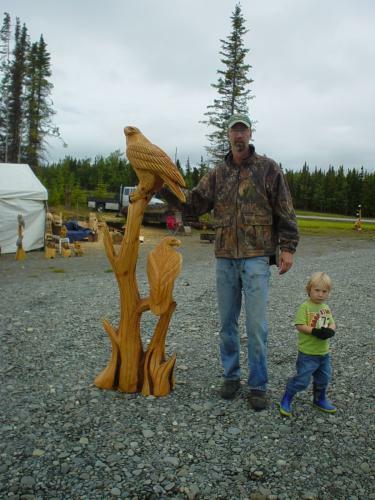 This is the first chainsaw carving in this style for Eric and he was so inspired by it that he even modeled his 2010 competition piece after it. Here is the side view of the Launching Perched Eagle tree. Notice the fullness of the tail. 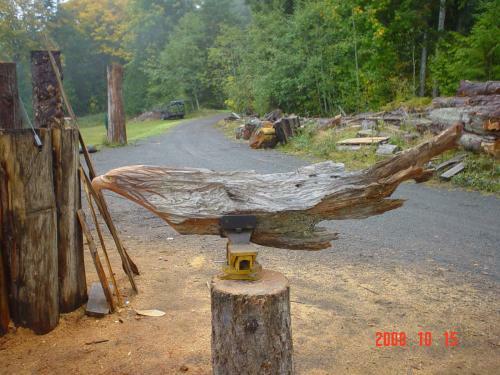 Doesn't it just seem like this carving is about to take flight?